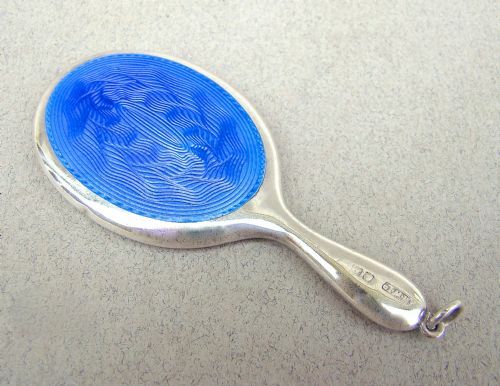 This is an exquisite miniature silver and cobalt blue guilloche enamel novelty purse mirror is in. The front with the original "reduction" mirror. The original puff ball is in place. The engine-turned back a vivid blue. The silver handle fitted with a suspension ring. HW LD for Henry Williamson Ltd.
Mirror height x width: 4cm x 3cm / 1.4 inches x 1.2 inches. Minor ding on one side or hollow silver frame. 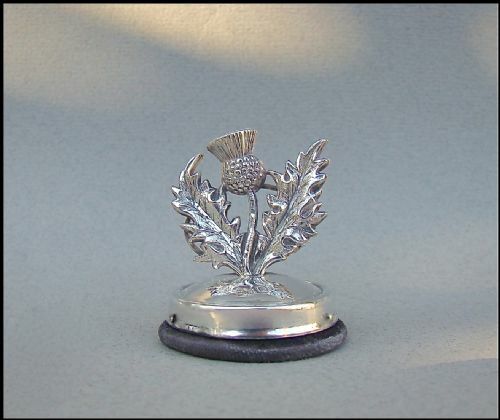 This exquisite solid silver Thistle menu holder was made in Birmingham 1907 by the prolific silversmiths Adie & Lovekin. The domed silver circular stand mounted on a velvet covered base. A decorative thistle emanating from the centre. The back with an oval loop designed to hold the place card in position. Height: 3.5cm / 1.2 inches. This delightful solid silver bookmark was made by the prolific silversmiths Crisford & Norris. 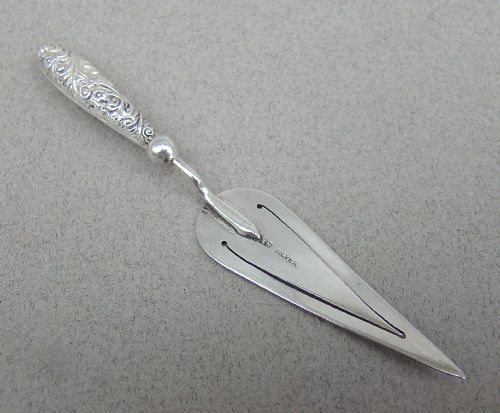 It is modelled as a trowel and has a very pretty embossed handle. The blade bearing Crisford & Norris hallmarks. 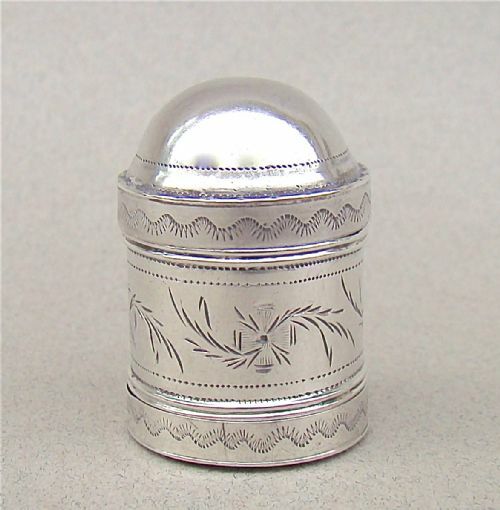 Crisford & Norris made unique silver items during the late Victorian era and early 20th Century. Their speciality being novelty pin cushions, babies rattles, bookmarks, nurses buckles and other numerous novelty silver items. 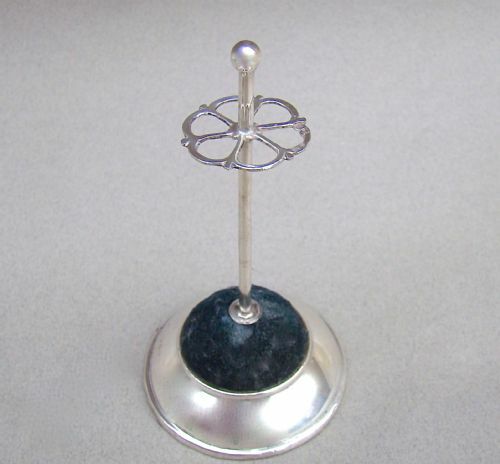 This elegant silver hatpin stand is hallmarked for London 1921. It is raised on a circular base and fitted with the original blue velvet cushion. The base has a black leather underside. 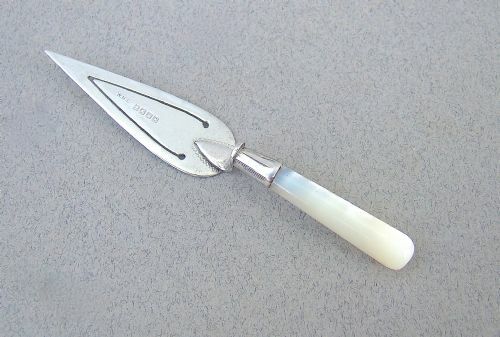 The silver stem with ball finial and a scalloped holder divided in six sections. Date letter "f" for 1921. Height: 11cm / 5 inches. Base: 6cm / 2.2 inches. Silver base a little uneven. This elegant and useful propelling pencil case was made by the collectable Sampson Mordan & Co and is dated London 1899. Of fluted column design with reeded slider. This exquisite and very rare Georgian silver travelling corkscrew is dated Birmingham 1794 and was made by the prolific silversmith John Taylor, who specialised in small pieces and objects of vertu. The silver collar with a stunning green stained ivory barrel-shaped handle. The reeded cover unscrews to reveal the original steel helix. The cover is fully hallmarked at the base, which is quite unusual and is a bonus. Date letter "w" for 1794. Silver in very good condition.. This exquisite and very unusual Georgian nutmeg grater bears the marks of the sought-after silversmith Samuel Pemberton and is dated Birmingham 1795. Nutmeg graters are scarce and usually in poor condition. This one is in excellent order, is fully hallmarked, which is not always the case. The bright-cut cylindrical body is the perfect size to house a nutmeg, as can be seen on one of my images. The pull-off domed cover opens to reveal the original steel grater. The lower section with a pull-off lid protecting the grater. The inner lid is fully hallmarked. Date letter "x" for 1795. No dings, repairs dents to the cover or main body. Pull-off base in excellent condition. One minor split on domed cover, commensurate with age, tiny and mentioned for accuracy. 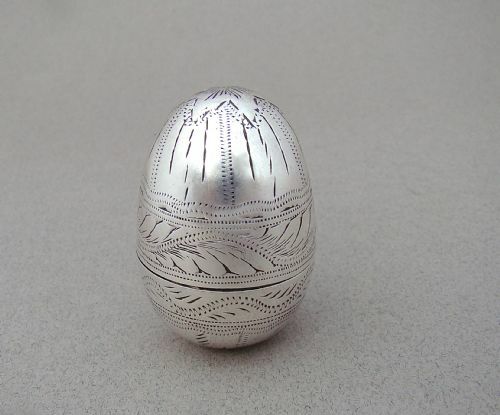 This is a divine George III silver egg-shaped nutmeg grater. The pull-off cover revealing a steel rasp. Engraved all over with delicate bright-cut decorations. 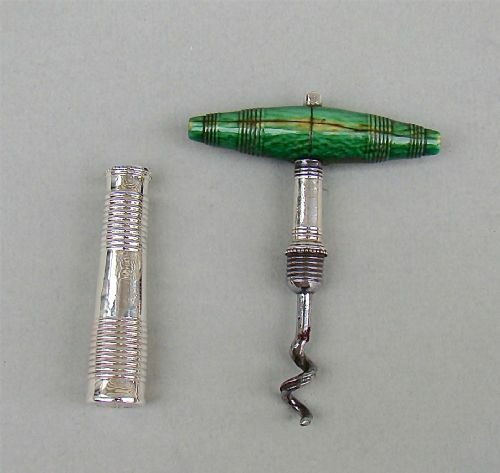 Unmarked, as it was very often the case with Georgian small objects of vertu , but guaranteed and tested as silver. Height: 4cm / 1.6 inches. 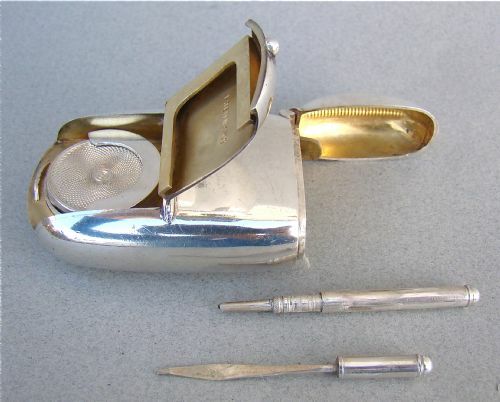 This is a superb quality Victorian silver combination Vesta/Sovereign Holder/Stamp Holder with Toothpick and Pencil. It is fully hallmarked for Chester 1898 and bears the Patent number 4709. The front engraved with initials and a crest, the back plain. The lid with spring mechanism incorporates a striker. The back with hinged cover opens to reveal a sovereign holder and a stamp compartment. It is rare to find one of these in complete form. Length: 6cm / 2.4 inches. Width: 3.5cm / 1.4 inches. Spring mechanism in good working order. This unique and rather wonderful solid silver, sprung mechanism, aide mémoire was made by the excellent Chester silversmith Colen Cheshire. 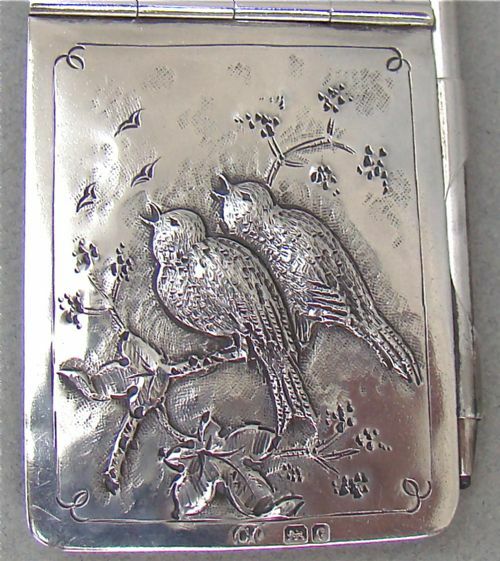 The cover is engraved and embossed with two tweeting birds on a branch, it is very naturalistic in style. 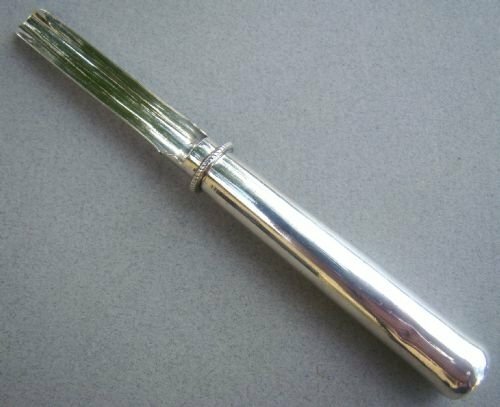 It is hinged and maintained in place by a side silver lead pencil. The interior with the original notebook, most pages still present . Date letter "c" for 1903. Sprung mechanism in perfect working order. 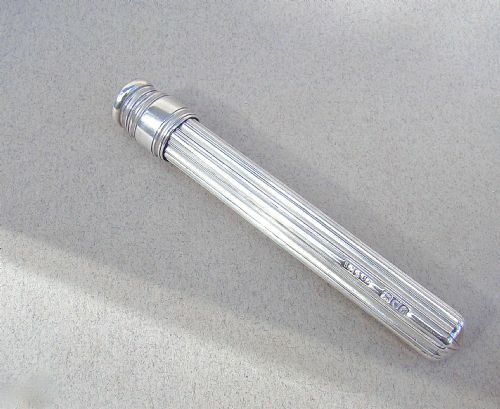 Pencil slides in beautifully and retains the original lead pencil. Superb George III solid silver apple corer by the very collectable Bateman silversmiths. Georgian apple corers are now quite rare and very desirable. Pretty good for a useful ustensil dating 215 years. Minor 4mm split on top of blade (as seen on image 2).